While preparing for a sacrament service sometime between August and September 1830, Joseph Smith received the following revelation from the Lord: “Wherefore, lift up your hearts and rejoice, and gird up your loins, and take upon you my whole armor, that ye may be able to withstand the evil day, having done all, that ye may be able to stand” (Doctrine and Covenants 27:15). The Lord then presented a number of spiritual attributes and blessings associated with specific pieces of armor: (1) “loins girt about with truth,” (2) “breastplate of righteousness,” (3) “feet shod with the preparation of the gospel of peace,” (4) “shield of faith,” (5) “helmet of salvation,” and (6) “sword of my Spirit” (vv. 16–18). Readers familiar with the New Testament might recognize right away that Doctrine and Covenants 27:15–18 is significantly referencing Ephesians 6:13–17. What some may not notice, however, is that the Book of Mormon also contains many scattered references to spiritual armor. While some of these may, at first glance, seem to refer simply to military descriptions of common ancient battle attire, careful reading shows that, in a number of cases, Nephite writes acknowledged and intended a symbolic or spiritual interpretation. In some instances, the spiritual symbolism is even stated explicitly. In his patriarchal blessings to his children, Lehi taught, “Awake, my sons; put on the armor of righteousness” (2 Nephi 1:23). This verse indicates that, from the beginning, Nephite prophets recognized armor’s symbolic value for spiritual protection. It’s possible that Lehi was loosely quoting Isaiah 59:17, which is surely a source that Paul also drew upon when composing Ephesians 6:14, 17. Before presenting the “title of liberty” to his people, Captain Moroni clothed himself in full battle attire, which included “gird[ing] on his armor about his loins” (Alma 46:13). The next two verses emphasize that the “true believers in Christ took upon them, gladly, the name of Christ” (Alma 46:14–15). After Moroni gave his rallying speech, these true followers of Christ followed Moroni’s lead and “came running together with their armor girded about their loins” (21). When testifying before King Noah and his priests, Abinadi made four successive references to the feet of those who “bring good tidings” and “publish peace” (Mosiah 15:15–18). In several other Book of Mormon stories, one army would surrender to another by throwing down their weapons at the feet of their enemy. In one instance, the enemy soldiers “threw down their weapons of war at the feet of Moroni, and entered into a covenant of peace” (Alma 44:15). In another, they “cast them at the feet of the Nephites, pleading for mercy” (Alma 55:23). These stories suggest that feet and peace were linked ideas in both religious and military contexts. While head-plates (the term for protective head gear in the Book of Mormon) aren’t specifically linked to salvation in the Book of Mormon, the head which they were designed to protect is. Concerning Christ, King Benjamin taught, “And under this head ye are made free, and there is no other head whereby ye can be made free. There is no other name given whereby salvation cometh” (Mosiah 5:8). Although “head” likely means a “chief” or “leader” in this case, it also seems to have reference to one’s forehead, where the name of the Lord would symbolically be written. Like a helmet, the name of Christ offers protection and salvation for all who have it symbolically written in their foreheads (see Revelation 22:4). In the Book of Mormon, the sword is often symbolically linked with God’s divine justice. However, in some cases it is also linked with the God’s Spirit. For instance, after Abinadi made his case against King Noah and his priests, we learn that “the people of king Noah durst not lay their hands on him, for the Spirit of the Lord was upon him” (Mosiah 13:5). Two verses later, Abinadi declared, “therefore I finish my message. Yea, and I perceive that it cuts you to your hearts” (v. 7). In another case we learn that God’s justice and truth “cutteth [the guilty] to the very center” (1 Nephi 16:2). We can be confident that it is the Spirit which facilitates this sword-like cutting into the heart because Nephi had earlier taught, “for when a man speaketh by the power of the Holy Ghost the power of the Holy Ghost carrieth it unto the hearts of the children of men” (2 Nephi 33:1). In a more positive light, when a “small voice” from heaven was heard among the people in 3 Nephi 11:3, “it did pierce them to the very soul, and did cause their hearts to burn.” Whether communicating God’s justice, truth, or peace, the Holy Ghost has the power to cut or pierce the hearts of men like a sword. These connections demonstrate that armor-of-God themes are not absent from the Book of Mormon. Rather, the symbolic value of armor can be seen in a number of its passages, and in some cases, the spiritual attributes associated with specific pieces of armor are similar to those developed in ancient Israelite warfare, as well as in Ephesians 6 and Doctrine and Covenants 27. What makes the Book of Mormon’s references to armor so powerful is that they are not just casual details inserted into combat narratives. Instead, the use of various types of armor, and the lack thereof, was often a major factor in deciding the outcome of military conflicts. 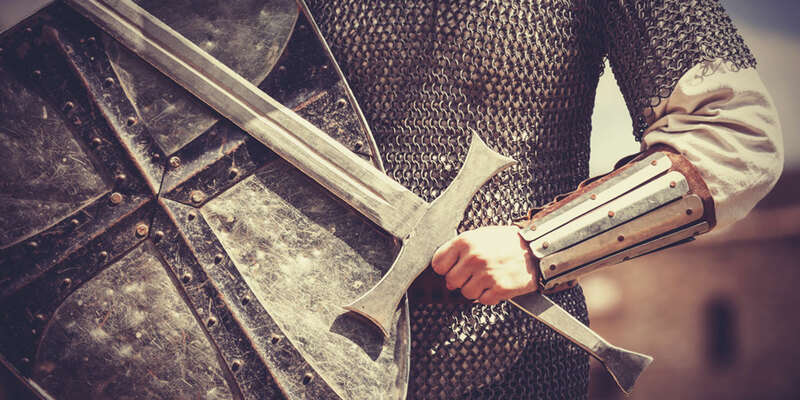 Because mortality is a constant spiritual battleground, the need for spiritual armor is ever present. For those who have entered into sacred temple covenants, Elder Russell M. Nelson taught, “Wearing the temple garment has deep symbolic significance. … Just as the Savior exemplified the need to endure to the end, we wear the garment faithfully as part of the enduring armor of God.” Those who put on the whole armor of God and never take it off will, like King Mosiah, reach end of their lives having “warred a good warfare, walking uprightly before God” (Alma 1:1). Dean Garrett, “Inspired by a Better Cause,” in Book of Mormon, Part 2: Alma 30 to Moroni, ed. Kent P. Jackson, Studies in Scripture, Volume 8 (Salt Lake City, UT: Deseret Book, 1988), 69–79. Revelation, circa August 1830 [D&C 27], p. 35, accessed September 22, 2017, online at josephsmithpapers.org. For a visual comparison of European and Mayan armor, see John W. Welch and J. Gregory Welch, Charting the Book of Mormon: Visual Aids for Personal Study and Teaching (Provo, UT: FARMS, 1999), chart 140. See William J. Hamblin, “Armor in the Book of Mormon,” in Warfare in the Book of Mormon, ed. Stephen D. Ricks and William J. Hamblin (Salt Lake City and Provo, UT: Deseret Book and FARMS, 1990), 409. See illustration and explanation in Chart 140 in Charting the Book of Mormon. Noah Webster, American Dictionary of the English Language (1828), s.v., “head”: “A chief; a principal person; a leader; a commander; one who has the first rank or place, and to whom others are subordinate; as the head of an army; the head of a sect or party. Ephesians 5:23.” See also, Matthew 23:10. Several scriptures recognize the head as a place of anointing, sealing, and even where sacred names reside. See Exodus 29:7; Leviticus 21:10; Numbers 7:1–2; Habakkuk 3:13; Revelation 7:3; 14:1. See also, Matthew L. Bowen, “Becoming Sons and Daughters at God’s Right Hand: King Benjamin’s Rhetorical Wordplay on His Own Name,” Journal of the Book of Mormon and Other Restoration Scripture 21, no. 2 (2012): 9–10. See Royal Skousen, “History of the Critical Text Project of the Book of Mormon,” in Uncovering the Original Manuscript of the Book of Mormon: History and Findings of the Critical Text Project, ed. M. Gerald Bradford and Alison V. P. Coutts (Provo, UT: FARMS, 2002), 15. See Book of Mormon Central, “Why Did Abinadi Use a Disguise? (Mosiah 12:1),” KnoWhy 310 (May 8, 2017). The “small voice” seems to be a reference to the “still small voice” from 1 Nephi 17:45 and 1 Kings 19:12. See Richard Dilworth Rust, Feasting on the Word: The Literary Testimony of the Book of Mormon (Salt Lake City and Provo, UT: Deseret Book and FARMS, 1997), 214–217. For a treatment of the ironic differences in these groups’ battle attire, see Parrish Brady and Shon Hopkin, “The Zoramites and Costly Apparel: Symbolism and Irony,” Journal of the Book of Mormon and Other Restoration Scripture 22, no. 1 (2013): 40–53; Book of Mormon Central, “Why did Mormon Emphasize the Zoramites’ Costly Apparel? (Alma 31:28),” KnoWhy 283 (March 6, 2017). Robert D. Hales, “Stand Strong in Holy Places,” Ensign, May 2013, 48, online at lds.org. Joseph B. Wirthlin, “The Priesthood of God,” Ensign, November 1988, online at lds.org. N. Eldon Tanner, “‘Put on the Whole Armor of God’,” Ensign, May 1979, online at lds.org. Russell M. Nelson, “Personal Preparation for Temple Blessings,” Ensign, May 2001, online at lds.org. See also, 1 Timothy 6:12; 2 Timothy 4:7. These are powerful observations and they have lifted me this morning. Just a note that Ephesian’s description of the Armor of God does not end with verse 17. The punctuation does not show the ‘.’ Period until the end of verse 20. Most stop reading in verse 17 which leaves out Paul’s ‘why’. The armor has multiple purposes. D&C 27 declares that we may withstand evil with this armor and Ephesians declares that the armor is worn that we may open our mouths boldly in declaring the gospel. “that I may open my mouth boldly, to make known the mystery of the gospel, 20 For which I am an ambassador in bonds: that therein I may speak boldly, as I ought to speak.” Wars show armor physically in the BoM and the symbolism to the spiritual armor is enlightening. A little more subtle is the armor the sons is Mosiah, Alma, Samuel and others wore as they preached the gospel and invited others to come unto Christ. They wore their spiritual armor and it was visible to the reader who remembers Paul’s why - to open our mouths boldly to make known the gospel!